Any band hailing from Sweden and playing any form of heavy, melodic, power or progressive metal should immediately put a bulls eye on the back of their denim jackets because the music critics are gunning for you. It comes with the territory these days. Thankfully, for this music reviewer, this is my first experience with the melodic heavy metal band Crystal Eyes. I have no preconceived opinions about them. However, I do know that as much as they have been appreciated over six albums, they definitely have their multitude of detractors. I'm not one of them. I liked 'Chained.' It's hardly perfect, but it is definitely vibrant and entertaining melodic metal. From start to finish 'Chained' has a steady and bright, though sometimes predictable, melodic metal pace. The hallmarks of this recording are two-fold. First, Nico Adamsen's vocals are purely remarkable: steady, strong and versatile. He has definitely found his calling. Take note of his work on 'Waves Of War,' 'Shadow Rider' and 'The Fire Of Hades.' Secondly, following the first point, the vocal arrangements are thoroughly captivating as on 'Dying In The Rain' and the aforementioned 'Waves Of War.' Kudos should also go to a very agile rhythm section and, where given the opportunity to shine, the crisp guitar work. 'Shadow Rider,' 'Waves Of War' and 'Lonely Ball Of Fate' are quite exemplary and thrilling. With this said, of greater importance, and what's more impressive, is how well this unit performs together. Crystal Eyes is truly a case where the sum has become greater than the individual parts, a very good thing. The only flaw that I could find was in the lyrical content (though I often don't listen that carefully to the words). Songs like 'The Devil Inside' and 'Lonely Ball Of Fate,' though impressive melodic heavy metal, had innocuous and shallow lyrics. For all these reasons, I found Crystal Eyes' 'Chained' a delightful and entertaining dose of pure melodic heavy metal. And for the same reasons, I'm sure their critics will plow them under. Hey, to each his own. Very recommended! 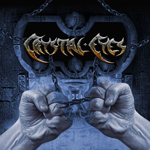 I found Crystal Eyes' 'Chained' a delightful and entertaining dose of pure melodic heavy metal. Strong lead vocals, vocal arrangements, rhythm section, and fret work make this work a guilty indulgence.